President Barack Obama and first lady Michelle Obama greet guests at the Congressional Black Caucus Foundation’s 46th Annual Legislative Conference on Sept. 17, 2016, in Washington, D.C. 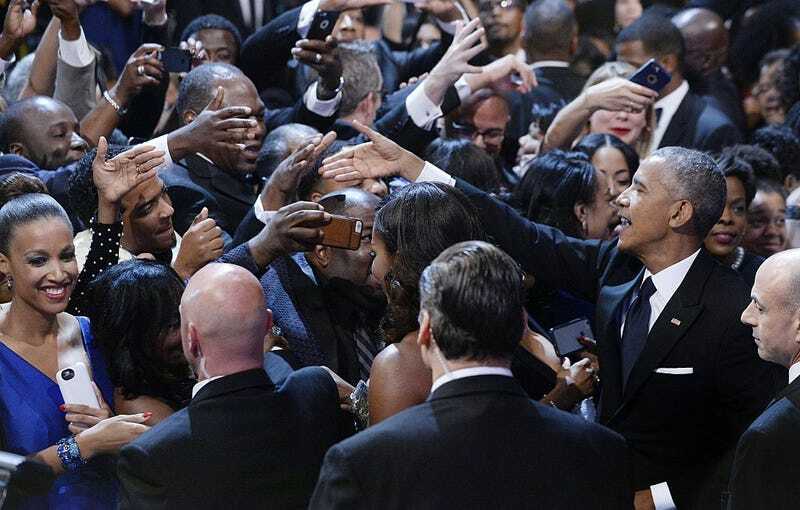 When Barack Obama was elected president in 2008, the unprecedented event was a moment of jubilation and historic revelry for the members of the Congressional Black Caucus. What no one anticipated was the difficult relationship between the first black president and the then-42 members of the caucus. The president always maintained the clear upper hand by simply holding a much more powerful position than any member of Congress and more importantly by having an exultant status in the minds of many of their African-American constituents. The president also enjoyed the power of the bully pulpit, which, for a president with superior speaking ability, was a power larger than most commanders-in-chief. The White House did not respond to requests for interviews about this story. The reluctance to discuss the relationship between Obama and the CBC wasn't surprising, given the irony of the situation. Any look back at the CBC relationship, from the White House perspective, includes the fact that many senior CBC members did not endorse then-Sen. Obama for president in 2007. It also includes the reality of what happens when a political upstart bursts onto the scene without the years of friendship building that occur between members serving in Congress over many decades. Though members of the Congressional Black Caucus spoke in general terms on the CBC-Obama relationship for this piece­, many were reluctant to relive the more painful details. The high point in the CBC-Obama relationship may have been right after his election, when the caucus, then led by Chairwoman Rep. Barbara Lee (D-Calif.), was meeting with members of the Obama administration on bread-and-butter issues. Soon the stimulus bill passed Congress (Democrats controlled both the House and the Senate). But by the end of 2009, the CBC and the president had had their first major confrontation. It was over the allocation of Troubled Asset Relief Program money in the wake of the subprime-mortgage crisis. Ten members of the CBC on the committee of jurisdiction, the House Financial Services Committee, boycotted the vote, and President Obama had to send his then-Chief of Staff Rahm Emanuel to Capitol Hill. The CBC members were protesting the lack of financial support for black-owned financial institutions and other entities. They were also quick to notice the Obama administration's willingness to support Wall Street over the needs of Main Street in the wake of the financial crisis. Given that Obama supported a plan to bail out banks after the subprime-mortgage crisis—a plan created by two captains of Wall Street, Treasury Secretary Timothy Geithner and former Bush Treasury Secretary and Goldman Sachs executive Hank Paulson—some in the CBC were suspicious. The clash over how to deal with the subprime-mortgage crisis, which would cause a massive collapse of black wealth, led to the first strain in the relationship between the president and the CBC in the first year of his presidency. Unlike what would happen in years to come, the first fight between the president and the CBC took place in the Rayburn House Office Building on Capitol Hill, out of sight from press. Members of the caucus were careful not to talk about the disagreement to the press because they were reluctant to be publicly critical of Obama. During Obama’s presidency, black members of Congress were often torn. Do they blindly support an icon of their African-American constituents, one whose face was hanging in church lobbies alongside that of Martin Luther King Jr.? Or do they react and speak out loudly on what they know is going on in their congressional districts day in and day out? Fairly or not, Obama's time in office was often viewed as the best chance in years to confront many of the problems in black communities. One of the biggest clashes between the president and the CBC happened over staggering black unemployment and jobs. The highest black unemployment rate in 27 years hit in September 2011. That year, black unemployment was over 16 percent—the highest since Ronald Reagan was president. “If Bill Clinton had been in the White House and had failed to address this problem, we probably would be marching on the White House. There is a less-volatile reaction in the CBC because nobody wants to do anything that would empower the people who hate the president,” then-CBC Chairman Emanuel Cleaver (D-Mo.) said to a reporter at the time. But two months earlier, in July 2011, Rep. John Conyers (D-Mich.), the most senior member of the CBC, did call for a march on the White House over the jobs issue. “[In 1987] we passed the first bill that allowed the government—in areas of high unemployment—to directly intervene and create jobs. Well, we’ve got the bill in here again and I’ve got nothing from the White House,” Conyers said during a July 27, 2011, press conference on Capitol Hill. In August 2011, the CBC embarked on a five-city jobs tour. The “For the People” Jobs Tour traveled through Atlanta, Cleveland, Detroit, Miami and Los Angeles. Cities like Detroit and Los Angeles were dealing with a black unemployment rate of nearly 20 percent at a time when the national average was around 9 percent. And caucus members were not happy. To make matters worse, the Obama administration announced a focus on a “rural-jobs initiative.” CBC members noticed that there was no similar “urban jobs” initiative. During the stop in Detroit on Aug. 17, 2011, Waters spoke to the audience at a town hall about being critical of Obama on the topic of jobs. It was the second stop of the CBC jobs tour, and Waters "went there." “If we go after the president too hard, you're going after us,” Waters said. “When you tell us it's all right and you unleash us and you're ready to have this conversation, we're ready to have the conversation. As black unemployment reached its highest level during the Obama presidency, the lowest moment between the CBC and Obama happened at the Congressional Black Caucus Foundation Gala on Sept. 24, 2011. It would turn out that what Waters ended up “unleashing” was a very angry 44th president of the United States. I don't know about you, CBC, but the future rewards those who press on. With patient and firm determination, I'm going to press on for jobs. I'm gonna press on for equality. I'm gonna press on for the sake of our children. I'm gonna press on for the sake of all those families who are struggling right now. I don’t have time to feel sorry for myself. I don’t have time to complain. I am going to press on. I expect all of you to march with me and press on. Take off your bedroom slippers, put on your marching shoes. Shake it off. Stop complaining, stop grumbling, stop crying. We have work to do, CBC. The president was clearly responding to months of criticism from black members about jobs. The moment was in stark contrast with the joint efforts and triumphs led by the president on health care only a year before, in 2010. Even though many congressional Democrats argued that the focus should have been on jobs instead, Obama's clear victory on something no other president could accomplish resulted in the rate of the uninsured—a disproportionate number of them African American—being reduced to the current level of 8.6 percent. The lowest rate in 50 years was the result of the president’s new health care law. Obama's presidency has to be weighed against a historic effort by Republicans to block every major policy idea that the first black president attempted to enact. There was a predictable backlash in a country with 400 years of racism behind it. Yet here was Obama, smashing through stereotypes as he ascended to the presidency—perhaps quicker, and in a more dramatic style, than many could handle. Republican obstruction was planned on the very night of Obama's first inaugural on Jan. 20, 2009, when Republican leaders in both the House and Senate pledged to fight every proposal from the new president, turning the GOP into “the party of no.” In 2010, then-Senate Minority Leader Mitch McConnell (R-Ky.) even vowed to make Obama a “one-term president.” It would create a caustically partisan environment, and one of the least productive Congresses in decades, as obstruction against the first black president became stated policy and Tea Party Republicans entered the House in January 2011. But there were other issues that had little to do with Congress that divided the Congressional Black Caucus and the president. African-American poverty increased over eight years. The percentage of blacks in poverty in 2009 was 25 percent; according to the Economic Policy Institute, it is now 27 percent—the highest poverty rate among any group. Poverty for African-American children went north of 30 percent and hit 40 percent in 2012. Yet the issue of poverty was rarely mentioned by the president or any members of his Cabinet. Then there were the administration’s policies that affected HBCUs. Even though the president re-established the HBCU advisory board in 2010, some members of the CBC felt that Obama had little regard for the institutions. The president's very first budget offered in early 2009 cut $80 million for HBCUs. Members of the caucus, with help from education-committee Chairman Rep. George Miller (D-Calif.), would later fix the budget gap. But in 2011, it was a change by the Obama administration to Parent PLUS Loans that would cause further problems for HBCUs. According to a report, the change would cost HBCUs over $150 million collectively in lost tuition and interrupt the educations of more than 25,000 HBCU students. With HBCU advocates floating the idea of suing the Obama administration over the problem, Obama's then-Secretary of Education Arne Duncan would apologize for it in September 2013, saying that communication, internally and externally, was poor. “I apologize for that, and for the real impact it has had,” said Duncan. In 2015, Obama offered an idea for the federal government to fund two years of free community college, a policy that many believed would hurt HBCUs. In August 2012, Morris Brown College filed for Chapter 11. In 2013, St. Paul College closed after 125 years. Administration policy decisions would cost HBCU institutions over $300 million. In February 2015, the chairman of the president's very own Board of Advisors on HBCUs spoke out publicly. “These are difficult times for our institutions, our students and their families—even more difficult than when we first began this journey together in 2009,” said Hampton University President William Harvey on Feb. 4, 2015. Finally, the CBC met with the president on Feb. 10, 2015. It was the first meeting between Obama and the caucus in over 600 days—their last had been in June 2013. It would also be one of their most contentious. According to CBC members who were at the meeting, the president said that he was against giving more money to institutions with poor graduation rates. With HBCUs graduating about 70 percent of all black doctors and dentists and 50 percent of black engineers and teachers, as well as over 35 percent of black lawyers, the topic of HBCUs and the first black president has been one of the most intense for the caucus. Many CBC members view education as the springboard into the middle and upper classes. Many said that they were not expecting to have to protect HBCUs from the first black president of the United States. Even though the relationship between the president and the CBC was strained, it was often the caucus that would come to his defense as attacks on the first black president grew louder and more irrational. After Donald Trump’s halfhearted attempt to walk back his 5-year-old Birtherism claims about the president on Sept. 16, during CBC Week this year, members of the caucus fired back. “Donald Trump is a disgusting fraud. … He started this disgusting behavior seven or eight years ago, questioning the president's citizenship. He would never have done this to Mitt Romney. … He would have never done this to any other white running for president,” said CBC Chairman Rep. G.K. Butterfield (D-N.C.) at a press conference where several CBC members stood shoulder to shoulder in support of the president. At the annual CBC gala Sept. 17, Obama called on black voters to protect his legacy, saying that it would be a personal insult if they didn't vote. In the closing months of the Obama presidency, it remains to be seen how much of the power of his legacy is transferable to others, including his former Secretary of State Hillary Clinton. The report card on the Obama presidency and black progress will come after the first black president departs the White House in three months. The White House is already laying the groundwork, having released a report earlier this month touting the progress of the black community under the Obama administration. So much of the way Obama will be judged must be placed on the sliding scale of mindless Republican obstructionism. But on several other issues, particularly those that have affected black communities, the decisions to act, or not, have rested squarely in the hands of America's first black president.